When Was The Last Time You Washed Your Pillow? You already know it is important for you and your family’s hygiene to regularly clean blankets and sheets, towels, bed and couch covers? Well, your pillows also need to be cleaned regularly, at least every six months. This is because a pillow that has not been cleaned recently will contain high amounts of sloughed skin, mold and mildew, fungus, dust mites, and dust feces. Nobody wants to sleep on that. We will give you some effective way to clean your pillows, depending on their material, and what tricks that can be used to keep them clean longer. Cotton and down pillows can be cleaned in various ways. You can hand wash, machine wash, or dry clean them. If you choose to hand wash, then use a mild detergent instead of a bar soap, as bar soaps may leave residues. Wash gently using warm water. Rinse well in cold water squeezing the pillow constantly to ensure that there is no residue left. In machine-wash, you should make sure that detergent is completely diluted in water before placing the pillows inside. You can do that by letting the machine run for a few minutes with after adding the detergent and before adding the pillows. Then stop it, squeeze the air out of the pillows and put them in the washing machine. Set your washer on a gentle wash cycle. An extra rinse would be ideal, but if your washing machine does not have that button, then simply put the pillow through the final rinse cycle once or twice to fully rinse out any residue. Do not use softener in the rinse. Instead, choose vinegar to help in the removal of the residue. Very little vinegar, two or three drops is enough. Add a tennis ball to keep the down from bunching up into a corner during the spin cycle. Hit the spin dry feature twice to ensure that most water has been removed. Synthetic fiber pillows can also be hand or machine-washed the same way as before. Lower quality fiber pillows may bunch up after cleaning. If that happens, pull out the fibers and redistribute them after drying. In synthetic pillows use the spin dry feature only once, so that the fibers bunch up as little as possible. Feather pillows can be washed by hand or dry cleaned. Hand-wash them exactly as you would with a down pillow, but using less detergent. Also, keep in mind that feather pillows are harder to get wet because the feather tends to repel water. Do not forget to use a little vinegar during the rinsing. Foam pillows can only be hand washed very gently with mild detergent. Mix water and detergent first, then gently squeeze the soapy water into the pillow by pressing smoothly on the pillow repeatedly. Do not wring or twist them, because they are very delicate. Rinse well using vinegar during the rinse. Wool pillows should be dry cleaned, because of their material, which makes it very difficult and unsafe for them to be cleaned in any other way. It is important that before attempting to wash your pillows you should read the care instructions on the package. 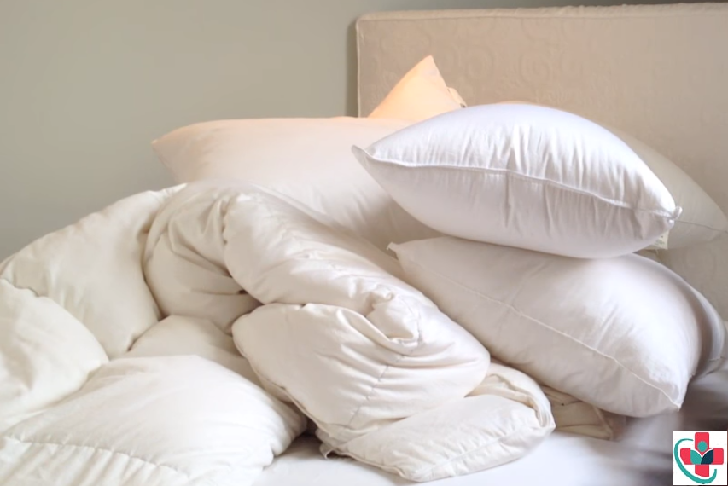 Use some of these tricks to keep your pillows clean longer. Use two pillowcases on your pillows to resist the accumulation of dust and bacteria, sweat, and other body fluids. Use a pillow protector as an additional barrier against dirt. Change your pillowcases often as dirt penetrates the fabric and will end up on your pillow.